Vélo Vogue: Tandem with CB! 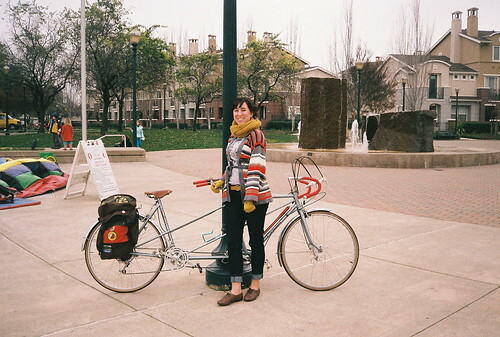 recently the mister and i got our very first tandem, a gottfried french tandem to be exact. we named him gilbert. he is a beautiful grayish blue with accents of red in white...we joke about dressing up in french style clothing and riding around town. 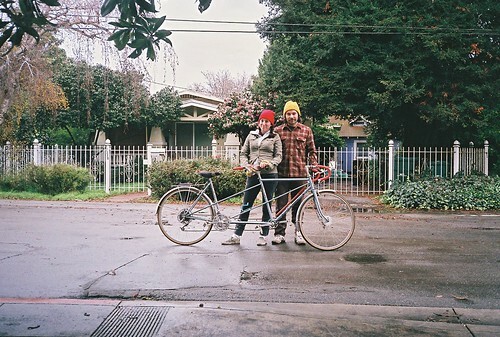 riding a tandem is a very unique experience, really unlike any other i have come across. the tandem must act as a team...almost everything we do must be in unison. the captain, who is the person in the front controls the brakes, shifting, & steering and the stoker (that's me) is the person in the back. the stoker is the engine and sets the speed of the ride. if we don't act as a we can seriously hurt one another & the bike. we are getting the hang of it each time we ride and it becomes more fun each time! this is our 3rd ride out on gilbert to the farmers market. gilbert is pimped out with our swift industries panniers! thanks for featuring us!! so much fun sharing! THANK YOU, cb! Ride on!